Kwame Essien is an Associate Professor of History and Africana Studies. He received his BA in History at The University of North Carolina, Greensboro; his MA in African Studies at The University of Illinois, Urbana-Champaign; and his PhD in African and Africa Diaspora History at the University of Texas, Austin. He was a Derrick K. Gondwe Fellow at Gettysburg College, Pennsylvania (2009-2011). 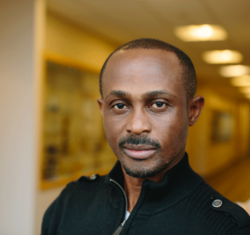 Essien’s interdisciplinary research focuses on comparative histories of slavery, reverse migrations, race and cultures in Africa and the African Diaspora/Atlantic world. He is the co-author of Culture and Customs of Sudan (2009), co-editor of Pan-Africanism and the Politics of African Citizenship and Identity (2014), and has published other works. Essien’s new book, Brazilian-African Diaspora in Ghana: The Tabom, Slavery, Dissonance of Memory, Identity and Locating Home (Michigan State University Press, 2016) is the first academic book that examines the untold story of freed slaves from Brazil who resettled in Gã (Accra), Ghana from the early 1820s. Essien argues that freed Africans escaped slavery in Brazil into colonial oppression in Ghana. The book shows how João Antonio Nelson and other “returnees” challenged British colonial officials after they seized gifts of land MãŋtsƐ Tackie Komeh, Gã king (1826-56), gave to the returnees when they arrived. The returnees’ unmatched fortitude enabled them to make various contributions to the social history of colonial Accra. Essien provides ample archival and ethnographic evidence to show how the returnees thrived socially, culturally, and economically despite the challenges they encountered after their settlement. His new project, a comparative study tentatively entitled Collaborators, Traitors and Opportunists in Ghanaian History, explores the complex interactions between Europeans, Kwaku Andoh, the chief of Elmina (1884-1898) and other kings and chiefs of coastal Ghana from the late nineteenth century. Essien explores individual and collective interactions and exchanges between Europeans and selected coastal leaders, during the abolition of slavery and the onset of British colonization. Essien’s courses cover various themes including slavery, reverse migrations, migrations to and from the Atlantic world/diaspora, gender, sexuality and race in African societies, globalization and Africa, Aid and NGOs in Africa, the history of diseases, healing and wellness in Africa and others. Essien believes study abroad is an extension of classroom learning. He has raised money from donors for underrepresented students to experience international education. Since 2014, he has led various study abroad programs to Ghana with over 50 students to expand Lehigh’s summer global initiatives. Essien's programs have been mentioned in several publications, including Lehigh's Acumen, Wbur and Newsworks. Essien Discusses his latest book: 'Brazilian-African Diaspora in Ghana: The Tabom, Slavery, Dissonance of Memory, Identity and Locating Home.' Please click here or on the image to see the video.